The focus of the Half Moon Bay International Marathon is to showcase the beauty of the Northern California coastline and our unique "Coastside" environment, sharing what we consider to be "Running Heaven" with athletes from around the world. To preserve and protect our beautiful habitat, we have built a world-class event that is sustainable for years to come by minimizing the impact as much as possible on our delicate eco-system. 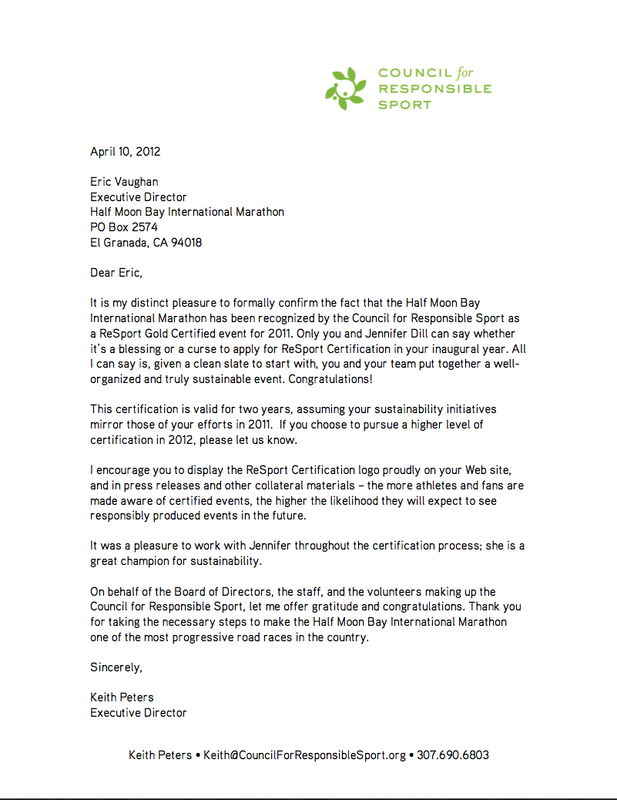 In our inaugural year of 2011 we attained the coveted Gold Certification from the Council for Responsible Sport, achieving the highest level of certification in recognition of our extraordinary efforts. We are very proud of this achievement, and it reflects our investment, focus and a team of efforts led by our Chief Green Officer. We worked with the non-profit organization Athletes for a Fit Planet as consultants on our efforts to attain this success and we are grateful for their advice and guidance. In 2012 we encouraged our athletes to make a difference by purchasing carbon offset "Green Tags", and Green Laces from the non-profit organization greenlaces.org and many took advantage. A total of 71 Green Tags were purchased by HMBIM athletes. Each Tag offsets 300 lbs of CO2 so the total CO2 offset is 21,300 lbs of CO2 or 10.65 US tons. 13 pairs of Green Laces were also purchased. Click here for details on our Sustainability Plan. BYOB! Bring your own water bottle. This helps greatly reduce the number of paper cups used out on the course. Each aid station along the course will feature a BYOB station where pitchers will be ready to refill your bottle! BYOB is strongly encouraged, however we will have cups with fluids at the aid stations if needed. Recycle! Our goal is to have less than 1 lb of landfill waste per athlete. To make this happen, we will provide recycling bins for bottles, cans, plastic and cardboard. Please make use of them! Composting! We aim to compost all food waste along with the food service products (plates, cups, utensils). Carpool! If you have friends who are running the race, please share a ride to the start and from the finish! Thank you for joining us in the care and concern for our Coastside running environment! We look forward to seeing you out there on the course!